How would you feel about your local police department regularly going through your trash? New York city residents don’t wonder — it’s happening now under the regime of left-wing mayor Bill de Blasio. They are so big on “privacy” they invented it as a constitutional right and pretty much lose their minds if anyone points out there isn’t actually a right to privacy spelled out in the U.S. Constitution, but when it comes to actually believing the citizens have a right to keep their stuff private from the government, where are they? They are busy putting the government into your business, that’s where they are. A person’s trash tends to have a lot of personal things in it. Check stubs that show what you earn; bills that show what you spent and on what; bottles showing what prescription drugs you take; boxes that birth control devices came in and lots more. You want to know a person’s secrets, go through their trash. 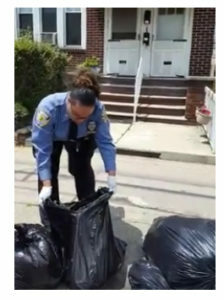 So the same liberals who claim a “right to privacy” so sacrosanct we are told to allow the killing of unborn children to protect it will send the police department to your home to rifle through your trash, as described in this report, including video about New York City police officers going through people’s trash in order to make certain they didn’t put anything into the regular trash that could have been recycled. The news article about the video extensively quotes the National Center’s own Jeff Stier. Mayor de Blasio and his ilk apparently believe recycling is more important than babies’ lives. How sane people can believe this is beyond my understanding.